There are many ways to learn the difference between "there", "their" and "they're". Help your child determine the difference with this practise sheet! On this year three reading and writing worksheet, kids complete sentences by replacing two words with a matching contraction from the word box. 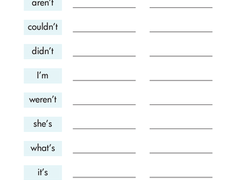 Dive into contractions with this worksheet that asks kids to complete each sentence with the proper contraction. Get a grasp on contractions with this helpful practise sheet! Your child will be building useful grammar and punctuation skills as he goes. Get rid of the grammar grumbles, and practise some contraction action! Your student can get familiar with some common contractions. Get rid of the grammar grumbles, and practise some contraction action! Your student can practise breaking down and creating contractions.